How many times have field-cut DI water pipes been installed only to fail the water pressure test? Once, twice or more often than we’d like? Even if it only happens once, the costs to find and repair the damage can be significant. One customer told us it cost $100K to find and repair the damage caused by the failed water pressure test. And, how did it happen? Simply because a gasket was ripped during the installation process. Infra-Tect’s Bevel-Sert is a pre-beveled, NSF 61 HDPE-compliant insert that can be used for field-cut ductile iron pipes. It snaps into the bell end of the pipe in front of the rubber gasket. When the field-cut spigot end is pressed into the bell, it wraps around the cut spigot end and provides a smooth movement without any damage to the gasket. It takes seconds to install by hand. 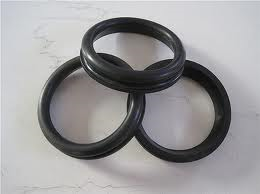 It reduces the frequency of cut, rolled or damaged gaskets when used with field-cut pipes. You now have a solution to help avoid failed water pressure tests when the Bevel-Sert is used with field-cut pipes. It will also save you significant time and costs when installing pipes and repairing water main breaks. 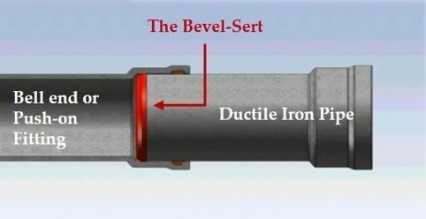 Plus, the Bevel-Sert greatly reduces stray currents across both factory pre-beveled and field cut pipes.